CF-QRI at the Tyee Spit, Campbell River, British Columbia. C-FQRI serving with Gulf Air, at Port Hardy - CYZT, British Columbia. C-FQRI of AirBC receiving attention for fire damage, at Calgary - CYYC, Alberta. C-FQRI at Downtown Vancouver seaplane base. C-FQRI out at Vancouver South. C-FQRI with Harbour Air, before repaint. • 58-1710 US Army. Delivered 29-Apr-1959. Initially assigned to 18th Aviation Company at Fort Riley, KS., prior to Vietnam deployment with that unit. May-1966. Returned to US for overhaul at Army Aeronautical Depot Maintenance Centre ARADMAC Depot, Corpus Christi, TX. Jul-1966. Returned to Vietnam joining 2nd Signal Group, and the Headquarters Company of 1st Signal Brigade, at Tan Son Nhut. Note: Aircraft named “Handy Capp”. Incident: Phu Tho, Southern Vietnam. Oct-1966. Forced landing caused by oiled up spark plugs. See below. Jun-1988. 388th Transportation Company, Vung Tau, Vietnam. Prior to shipment back to US. Dec-1968. Sharpe Army Depot, Stockton, CA where it was stored until deleted from the Army inventory in June-1969. • CF-QRI E.C.Braithwaite & Son Ltd., Campbell River, BC. Regd 25-Apr-1972. • CF-QRI Trans Mountain Air Services Ltd., Campbell River, BC. Regd 25-Apr-1972 (Possible lease). • CF-QRI Company renamed Gulf Air Services Ltd., 03-Aug-1976. • CF-QRI Possible sub lease to Alert Bay Air Services. • CF-QRI Company renamed Gulf Air Aviation Ltd., 18-Jan-1979. • C-FQRI Company taken over by J. Pattinson Industries to become part of Air BC Ltd. Regd 09-Dec-1980. Canx 05-Dec-1984. Incident: Port Hardy, BC 22-Jan-1980. Seriously damaged by fire on start up. Transported to Calgary for repair by Kimba Air. • C-FQRI Harbour Air, Richmond, BC. Regd 04-Apr-1985. Incident: Vancouver, BC. 26-Sep-1987. Engine stopped shortly after take-off and aircraft completed a forced landing with no damage. • C-FQRI Canx & re regd to Harbour Air 27-Apr-1989. Accident, Cameron Lake, Vancouver Island, BC. 08-May-1991.On a flight to Tofino on the west coast of the Island the aircraft encountered poor VFR weather. An attempt to land at Cameron Lake caused the pilot to settle into trees at the edge of the lake when encountering “dodgy” wind conditions. Four passengers were seriously injured and the aircraft seriously damaged. See further information below. Note: Aircraft subsequently removed to Kenmore Air Harbour facility at Seattle, WA. Note Purchased from insurers by James B. Hayton and was trucked to his facility at Sedro Woolley, WA. Otter 326 was delivered to the United States Army on 29th April 1959 with serial 58-1710 (tail number 81710). It was assigned to the 18th Aviation Company, Fort Riley, Kansas and deployed to Vietnam with the Company during January 1962. It continued to fly for the 18th Aviation Company until May 1966 when it was returned to the United States for depot level overhaul at the ARADMAC Depot, Corpus Christi, Texas. On completion of this work in July 1966, the Otter returned to Vietnam, joining the 2nd Signal Group based at Tan Son Nhut. It flew for the Headquarters Company, 1st Signal Brigade. The Brigade had an aviation detachment which operated eight UH-1 Huey helicopters, four Beavers and, in 1966, two Otters 81710 and 92225, which were used to transport troops and their equipment. 81710 was named 'Handy Capp' and 92225 the 'Red Baron'. An incident involving 81710 was recorded in October 1966, in the course of a mission flown out of Tan Son Nhut over the southern part of the country. As Terry Love recalls: “As we were returning, we started to lose power. It soon became evident that we would not make it all the way back to Tan Son Nhut, so we started to look for a place to put it down. As we neared Saigon from the south west, there are not a lot of spots to land an Otter but luckily we found one. It was Phu Tho horse racing track in the Cholon District. It had a beautiful grass infield where we put the Otter down safely. We called our support and they flew out from the heliport at Tan Son Nhut with a repair crew. The problem was oil-fowled spark plugs. They were changed and the Otter was ready to go. It was an interesting take off in waist high grass with the propeller making a wonderful grass mowing machine. Anyway, we made it back to Tan Son Nhut in fine shape”. 81710 continued to fly for the Brigade until June 1968, when it was handed over to the 388th Transportation Company, Vung Tau to be prepared for shipment home. It arrived at the Sharpe Army Depot, Stockton, California in December 1968 and was in store there until deleted from the inventory in June '69 and put up for disposal as military surplus. It was imported into Canada in July 1971 and first registered in the name of E.C. 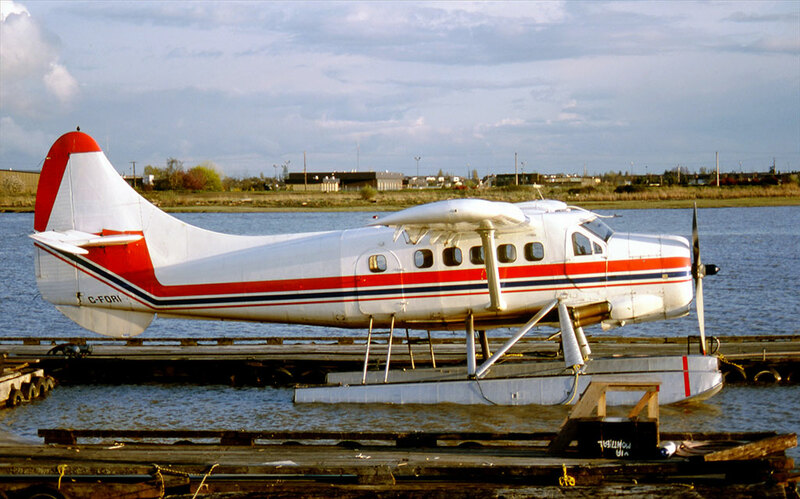 Braithwaite & Son Ltd., of Campbell River, BC, as CF-QRI on 25th April 1972 by which stage the Otter had been refurbished and converted to a civilian aircraft. On the same day it was registered to Trans Mountain Air Services Ltd., of Campbell River and entered service with that company, based at Campbell River on Vancouver Island. This was a forest industry company which used the Otter, two Beavers and some single Cessnas to provide transport for its own needs, flying its personnel to lumber camps. There was a change of name on 3rd August 1976 to Gulf Air Services Ltd., at which stage the company commenced commercial services for the public, and then another name change to Gulf Air Aviation Ltd., on 18th January 1979. All the while the Otter was serving the Pacific Coast from its Campbell River base. 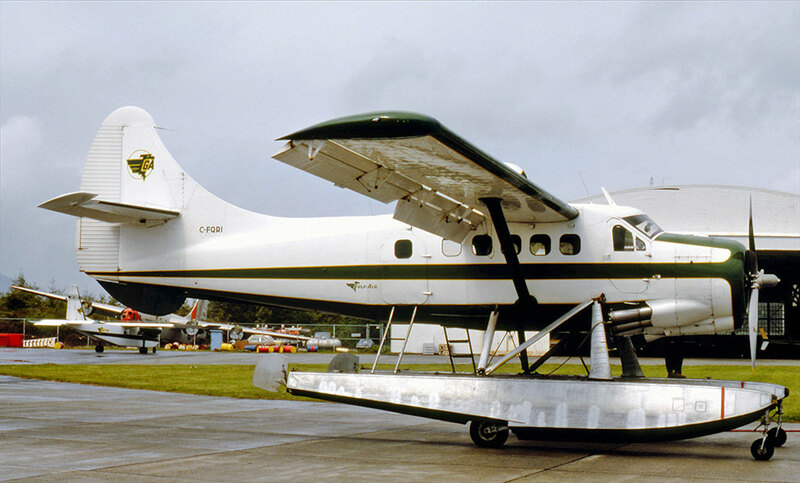 It flew for Alert Bay Air Services during the summer of 1978, a company which Gulf Air had taken over that year, and then back to Gulf Air Aviation Ltd, which became part of Air BC Ltd., to whom the Otter was registered as C-FQRI on 9th December 1980. The Otter was badly damaged when a fire erupted as it started up at Port Hardy on 22nd January 1982. At that stage, the Otter was still painted in Gulf Air colours. The wings were taken off and it was trucked to Kimba Air Services at Calgary for repair. 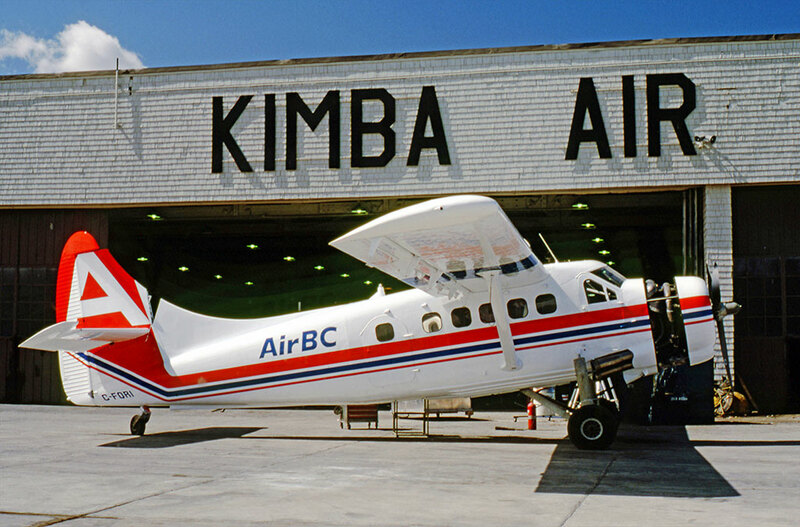 It emerged from the Kimba hangar in Calgary during May 1982, looking pristine in full Air BC colour scheme and re-entered service based out of Port Hardy the following month. 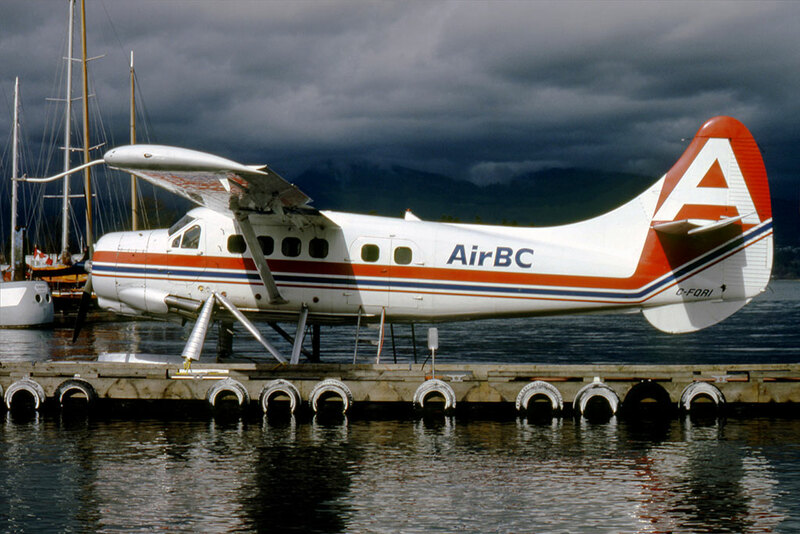 QRI continued to fly for Air BC until it was sold to Harbour Air Ltd., of Vancouver in March 1985. 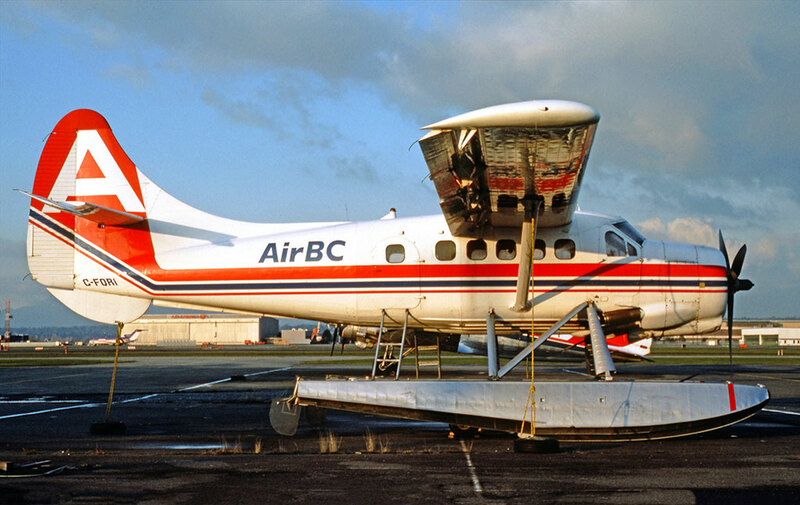 Air BC titles were removed from the aircraft on 21st March at Vancouver, but the Otter would fly for its new owners in basic Air BC colour scheme until repainted in full Harbour Air scheme some months later. 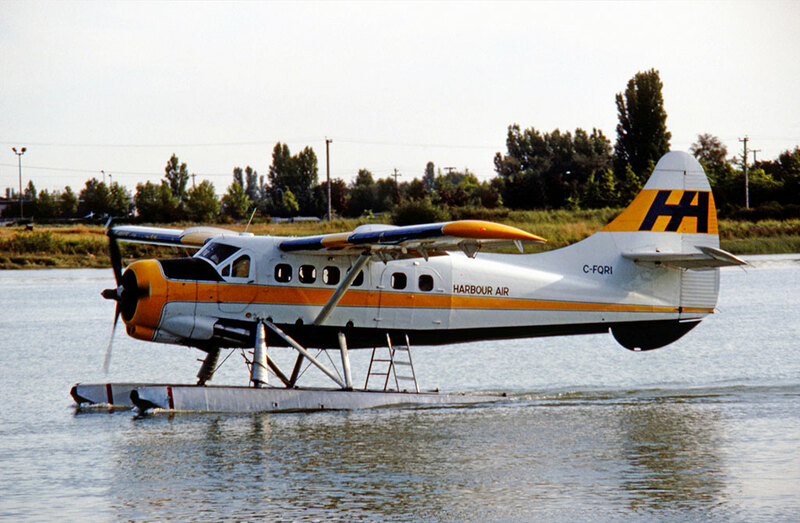 It was registered to Harbour Air in April 1985. An incident was recorded on 26th September 1987 while taking off from Vancouver on floats. Shortly after take-off, the engine started running rough and then stopped. A forced landing was carried out, but there was no damage and the Otter was soon in service again. The Otter was on charter to a film company from Los Angeles, and was carrying a film crew to Tofino for the day, to scout locations for a movie to be called, somewhat aptly, “Season of Fear”. According to a newspaper report: “The plane narrowly missed several tall tree snags and slid sideways along the mountain, shearing off its wings and tail, before coming to a precarious rest on the side of a fifty degree slope, at the 427 metre level of the mountainside”. As luck would have it, a 442 (Rescue) Squadron Labrador helicopter was in the area on a training detail from its base at Comox. It picked up the ELT signal from the downed Otter, and the occupants of the Otter were rescued within twenty minutes of the crash, much to their amazement. Due to their injuries, five of the survivors were airlifted from the site by stretcher and then taken to hospital in Comox. The Labrador then returned to the site, and managed to land on a flat part of the mountain five minutes walk from the crash site. The other six survivors managed to walk to the landing site and were also taken by the Labrador to Comox. That accident brought to an end nearly twenty years service for QRI along the Pacific Coast. 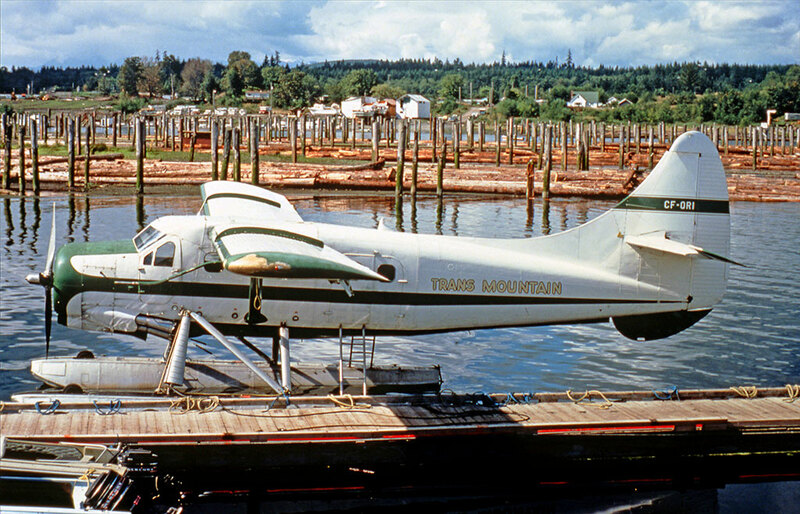 The wreck was taken first to Harbour Air's Vancouver base, and subsequently to Kenmore Air Harbor, Seattle, where it was noted in March 1993. It was purchased from the insurers by James B. Hayton and was trucked to his facility at Sedro Woolley, Washington, to the north of Seattle. The registration C-FQRI was cancelled on 22nd April 1993 “on export to the United States”. Mr Hayton's company, North Sound Aviation Inc., repaires and rebuilds DHC aircraft and the wrecked Otter was dumped in the long grass beside his hangar, alongside many more wrecked Beavers and Otters, awaiting eventual rebuild. It was still there ten years later.